What is the first thing that comes to mind when you plan to go on a diet? Salads, fruits, boiled vegetable, soups, oat bran rotis—day after day, week after week. Suman Agarwal and Tinu Shanghvi claim to have another equally healthy weight-loss plan, in their book The Don’t Diet Diet Cookbook (published by Vakils, Feffer and Simons Pvt. Ltd). “We believe you can eat healthy, lose weight and yet enjoy what you eat by following the basic nutrition concepts, i.e., eating the right balance of carbohydrates, fats and protein (CFP), and include foods rich in vitamins, minerals, phytonutrients and fibre," says Agarwal, a nutritionist who runs the Selfcare Clinic in Mumbai. Better protein is the first rule. 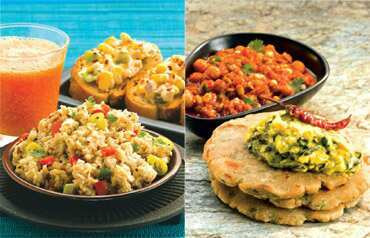 “The problem with most vegetarian Indian meal plans is that they are high on carbohydrates and fats," says Agarwal. “Also, the only source of protein, usually dal or kadi, is made in watery versions, especially in Rajasthan, Maharashtra and Gujarat. These recipes often don’t provide the kind of protein the body needs." She adds that whenever diets are discussed, most Indian clients want to know how to cut out fats, aka oils, from their food. “The body needs 20-25g of fat each day. An adult between 25 and 60 years can safely consume about 3-6 teaspoons of vegetable oil daily," she says. That’s why Agarwal suggests never cutting out fats completely. The other rules that Agarwal swears by, something most dieticians advocate these days, is to follow the 3-hour eating formula and the Japanese concept of “Hara Hachi Bu" or eat until you are 80% full. “I tell people that you should leave a little room at the end of every meal rather than overeating. Eat or drink something every 3 hours because it will help maximize your energy levels and control bingeing." In these recipes from the book, Agarwal suggests ways to balance some Indian meal plans that often go awry. 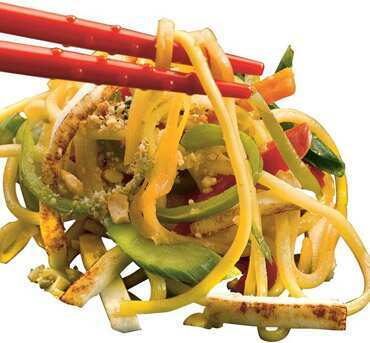 Healthy option: Adding tofu to noodles completes the meal. Plain rawa (sooji or semolina) upma does not have fibre. Also, tea with a meal such as breakfast does not really add any nutritional value, says Agarwal. To make a complete meal, protein in the form of curd or buttermilk is better instead of tea. Plus, adding oat bran to the upma makes the meal fibre-rich and an excellent breakfast option for diabetics and for people with high cholesterol and high blood pressure. Lightly roast the oat bran and keep aside. Bring four cups of water to a boil. Heat oil in a pan and roast the urad dal till it turns light brown. Add the mustard seeds, cumin seeds, curry leaves, green chillies, asafoetida and rawa, and roast till done. Now add the tomato and sauté for 2-3 minutes. Add the oat bran, sugar, lemon juice and salt and sauté for a few minutes. Slowly add the boiling water and keep stirring. Cook till the upma stops sticking to the sides of the pan. Add coriander leaves before serving. For a 1/2-cup serving—calories: 110 kcal; protein: 4g; fat: 2.5g; carbs: 19g; fibre: 2g. For 2 frankies—calories: 450 kcal approx. In a frankie, maida (refined flour) roti, potatoes and onions are used, which are high in carbohydrates and calories, says Agarwal. Instead of refined flour, use wheat flour. A chhole wrap is high in protein, iron and calcium, and has essential amino acids as well. It is an easy-to-make and nutritious meal to have at lunch time. Soak the chickpeas overnight (or for at least 6 hours). Pressure cook using four-five cups of water and up to five-six whistles. When cooked, drain the water and let it cool. Heat the oil in a pan, add the chopped onions and sauté. Then add the ginger-chilli paste and sauté for about 1 minute. Add the tomatoes and cook on a low flame for 5 minutes. Add chhole masala, amchur, red chilli powder and salt, and sauté for a few minutes. Now add the boiled chickpeas and chopped coriander. Cook till done and set it aside. To make a wrap, spread 1 tablespoon green mint chutney (optional) and the chhole mix on a roti made from wheat flour and roll it up. For 2 wraps—calories: 351 kcal; protein: 12g; fat: 8g; carbs: 57g; fibre: 4g. For 1 ‘vada pav’—calories: 370 kcal approx. The vada and pav are both high in carbohydrates and low in fibre. By avoiding potatoes which are fried, and by adding a wholewheat pav, or bun, you lower the intake of harmful calories, says Agarwal. Usal, a traditional Maharashtrian recipe, is a very nutritious dish and high in protein, fibre and iron. If you eat usal with bajra (wheat) roti and yogurt instead of pav, you have a complete, healthy meal. Pressure cook the pulses with six cups of water and a pinch of salt for four whistles and keep aside. Heat 1 teaspoon oil in a pan and fry the onions for 4 minutes. Once done, remove the onions and keep aside. Roast cumin seeds, chillies, poppy seeds, peppercorns, clove, garlic, bay leaf, turmeric and coriander, ginger and cinnamon in the same pan with 2 teaspoons of oil for 2-3 minutes. Make a paste of the roasted onion and the seasonings in a grinder. Heat 6 teaspoons of oil in a large pan. Add the paste and sauté for 1 minute. Add the tomato puree and sauté for 3-4 minutes. Now add the cooked pulses along with the water and allow to simmer for 10 minutes, or till done. Serve hot with some wholewheat pav or bajra rotis. For a 1-cup serving—calories: 182 kcal; protein: 9g; fat: 5g; carbs: 24g; fibre: 2g. For a 1 1/2-cup serving—calories: 600 kcal approx. The dumplings in vegetable manchurian are usually made with cornflour and refined flour, and are deep fried, says Agarwal. These have excessive carbohydrates and fats, and there is nothing nutritional about the gravy as well. By avoiding the gravy and the fried dumplings, and adding tofu to the noodles instead, you can increase the protein, calcium, fibre and even iron. Boil four cups of water in a vessel. Add the noodles and cook for 3-4 minutes. Drain and rinse under cold water, and toss with 1 teaspoon of oil to prevent the strands from sticking together. Set aside. Mix all the ingredients for the seasoning except the peanuts and set aside. Heat the remaining oil in a pan. Add garlic and onions to it and sauté for 1 minute. Add peppers, baby corn and carrot and allow it to cook for around 1 minute or till slightly tender. Add the tofu and noodles. Remove from gas and add the seasoning along with the groundnut. Mix well and serve hot. For a 1 1/2-cup serving—calories: 257 kcal; protein: 10g; fat: 6g; carbs: 40g; fibre: 3.31g.